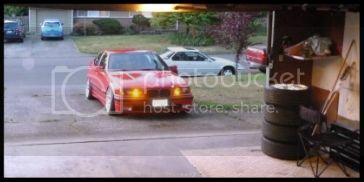 Earlier this year I was talking with another form member (Jimmyz66) about turboing his e34. We were planning a move out to Seattle which was fairly close to him and so we made arrangements. This car has a pretty long history and he has asked that we keep it going on this forum. As always lets start with an outline for some of the basics. This car has been partially assembled by at least 4 shops over 8 years so some details are not readily available. The current state of the car is pretty unfortunate. It is the cleanest e34 I have ever seen, and it is halfway through what seems like 3 different builds. The car previously ran for a short time after a very long build and dynoed around 500whp. After talking with Jimmy, we feel his needs are to get him into a reliable platform with a bit of headroom. He has driven this car less than 500 miles in what looks like 8 years. Jimmy set the bar for this build at 600whp with hopes for more. We received the car four weeks ago and were able to break ground on it a week later. We are planning for a 6 week build for this car which will put us tuning the car the last week of September. I could not source stainless head flanges, so i picked up some spare heads and CMM'd the head ports and designed a flange and purge block to be able to weld these nicely. The car will be running a DTAFast Ecu, Full sequential injection, full flex fuel, running factory coils. We will be adding a huge amount of sensors to the whole package to create a very consistent and reliable car. We will be reworking the RMS A/W intercooler including AN lines, -4 turbo feed, new AN Fuel system using an aeromotive regulator, We will have to reroute the AC lines to match our downpipe goals, We will tie this in with the current supersprint exhaust, Open dump on the wastegate. We are setting the car up through a singe 50mm wastegate with a 7 pound spring. The goal as of now is 4 boost settings, ranging from a 550whp base setting up to an 800whp setting. Building for headroom, but trying to get the car back in his hands as soon as possible. Sorry I don't have any real pictures of the car I haven't taken the time to pull them off the camera. I wanted to get this out there. Future updates will have build pics! Time to update your profile Zack. And that thing is going to be a beast!! Check out what just came in the mail. UPS working slow today. It will be nice to see this car and engine actually up and running well. Anyone whos been around a while knows its been a rough go of it. Was the car previously running a standalone? I can’t recall. I would love to come check this car out. Maybe a good excuse for a PNW get together? It was stock ecu. I was specifically asked to do a standalone, and honestly I think it’s a good car for it. I did disassemble a bit of the ecu last night. Grabbed stock ignition, fueling, dwell, cranking and a few other things to set the ecu up easier. Basically the same as other motronic ecus. I am not a huge fan of the motronic control strategy in boosted applications. We should absolutely get everyone together. In this case standalone is absolutely the way to go IMO. I think the main issue the car had in the past was a lack of good cotrol. The best hardware does not mean chit if its not properly controlled! It will be nice to see the bmw v8 extended to the point of making big power. I wish everyone involved welll. Turbo m60, following this for future reference haha, looks amazing so far! Zack, many heartfelt thanks for taking on this project for me. Cali is sorely lacking in good, reliable BMW custom tuners for the BMW V8s. Hell, I remember years back when there was no one who could make a decent turbo kit for my E34 535i. I have been through a lot, did not listen to members regarding Osh/RMS, but have always persevered and knew someday it would work out. I owe everything to Zack and am even happier that I have the opportunity to switch from supercharger to turbo. I have seen the light and am grateful. I upgraded the suspension and exhaust on my Porsche 997 Carrera S and decided not to upgrade the engine performance and spend the money on getting my 540i right. I think I made the right choice. Last edited by jimmyz66; 09-26-2018 at 06:36 PM. So I have had a void since photobucket and haven’t wanted to deal with it, so today I created a directory on the website and i will now upload pictures to it and can finally get back to posting images. I manually cut these images to half size but may need to go smaller, we will learn as we go! So we have been very busy lately, between releasing our e46 m3 tunes (which have been a success, netting at least 20whp) and developing e60 m5 tunes (Which will come out officially later this month) so I personally apologize for the lack of updates. Honestly we have been waiting for a turbo for what feels like months. With the recent success of our 6870 car we were keen to try the precision 7675. We ordered the turbo maybe a week after receiving the car but it has been on backorder since. Just last week we called and cancelled the turbo as we couldn't afford any more delays and we ended up ordering a Borg Warner S400sxe. I made a bunch of calls to friends that live in the v8 world, specifically to some tuners that work directly with coyote motors and talked to them about what turbine they like on their 5.0L 4 valve motors. General consensus was the s400sxe 83mm turbine was the best. We received the BW in 3 days of order, arriving just yesterday. For reference Coyote guys are running this exact turbo to a bit over 1000whp with full boost ~25psi around 3500 rpm. A lot of things come into play but that is an excellent benchmark. We ended up ordering the 76mm S400sxe, PN 14009097006 paired with a 1.10 ar turbine housing. This is a very nice turbo. Excellent castings, Vband housing connections, Billet wheel. As you dig deeper into wheel designs you find that they are as much art as they are science, and I’m really excited to try these out. The flanges I had water-jet cut never loaded on the first page, they turned out really nice. I had some extras cut if anyone else wants a flange set or a manifold. While we were waiting on the turbo we went ahead and made the manifold, we went with a tubular log style manifold. We used 1.75" primaries. Better manifolds could probably be made, but this is a really compact way to package this setup and these manifolds have been proven to thousands of hp. We went a bit further and jigged up the "primaries" to do the best inlet/merge one could achieve, without getting completely carried away. So this inlet allows us to direct the sonic pulse (from the valve lift) pretty effectively. This should minimize cylinder competition. The mass flow at lower rpm will probably stagnate a bit as we jump in chamber volume pretty aggressively. The purge block performed excellently. SO that's about it for now. As we will be making more photogenic progress in the coming week or so I’ll try to update more regularly. Last edited by vollosso; 10-06-2018 at 07:03 PM. Ah almost forgot, knocked out some fuel rails. Still have to thread them for fittings then ill clean them up. They are a bit "As machined" currently. I will be frank with you Zack. I was new to the BMW mod scene. With my E34 535i/5 I modded the heck out of it. I mean sway bars, sport swings and shocks, Miller WAR chip/MAF ( after Dinan chip and Unichip), short shift kit, custom Arc Audi stereo, M3 steering wheel, MK ! wheels. I even bought a BMW 7 series turbo kit. but could not find anyone to install and tune it. Before the Miller War chip/MAF, I was beaten on the highway by a Nissan 3.5L Maxima. 2 weeks later, I bought a used 540i with 50k miles and every item Dinan had in his cataloge including a supercharger, and had someone who was going to St. Louis and checked it out for me. Did not feel like the claimed 400+ hp when I first got on it and found out the old school Powerdyne Kevlar belt was broken. After that it went all down hill. Unichip tuner in Sacramento blew my engine on his dyno and blamed the engine as being "weak". Had an Audi shop re-tune it with new M60/M62 highbred. Still was not satisfied, so I mad the biggest mistake of my life by sending it down to RMS/Osh/Chris and they also blew up my new engine and blamed the head gasket. The racing shop that rebuilt my 4.9L M60/M62 engine said to was the fault of the so-called tuner. I brought to RMS just to get an E39 M5 after cooler, and he promised me and swore to God he knew how to tune my car. I gave him another chance and 3 years later I get my car and it dies at every stop light, runs super lean and fact my Autometer went as far as lean could go. I declined to send my car back to Osh. RK Tunes re-tunrd my engine and 150 miles later the engine blew up again. Jordan/RK Tunes said it was Osh's fault. Had the engine rebuilt again, but a little more aggressive cams and let my 540i/6 sit for over a year trying to find a quality, respected tuner.I had no luck until I read a post by vollosso. I knew in my heart and my past experience that I was in good hands with Zack and 22RPD Tuning. When I talked to him on the phone he was polite, extremely knowable, my importantly an engineer. I mean when I say he ha given me new hope in turning my E34 into a monster. He is extremely well versed on BMW's and turbo charging. In fact at first I just wanted him to tune my s/c system that I just put together (new Vortech V2h/dTi). In the back of my mind I always wanted a turbo system for it's options on different power levels and using exhaust to power the he'd unit. But honestly, I thought it would never happen because who makes a turbo kit for the E34 540i? Well, Zack changed my mind with his knowledge, personality and customer skills. I knew if I was patient I would get my car running as it should, but never in my mind did I think I would have the opportunity to have such a great forced induction system. I owe everything to Zack and Rebello Racing, who rebuilt my engine. Thank-you Zack, and not to be too syrupy, but it is an honor to meet you and have you work on my car. Last edited by jimmyz66; 10-08-2018 at 11:46 PM. Wau bro, so sad storry. Hope, now these guys know what they are doing. Wish you success. Also, i want share my experience after many m62 engines blown. The main thing is USING good known aftermarket ECU. With standalone, you will be safe.